If you can swim a mile in the pool you are ready to transition to open water! 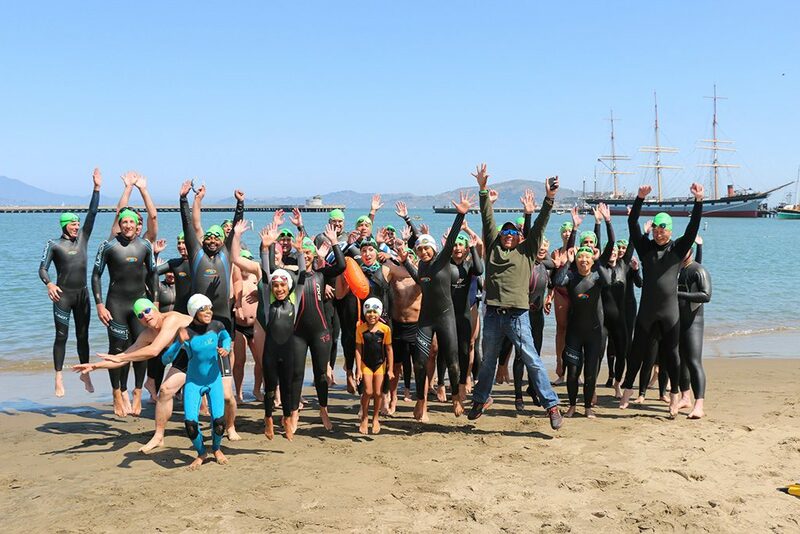 Our Swim With Pedro sessions are 1-hour workouts and a great place to practice in the open water with coaches on hand whether you're training for an event or getting into open water for the first time. 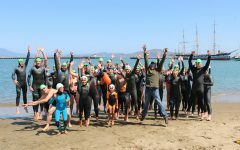 You’ll find both those new to open water swimming and those who have completed Alcatraz hundreds of times, but we divide the group into skill and confidence level so everyone gets the most out of their swim. 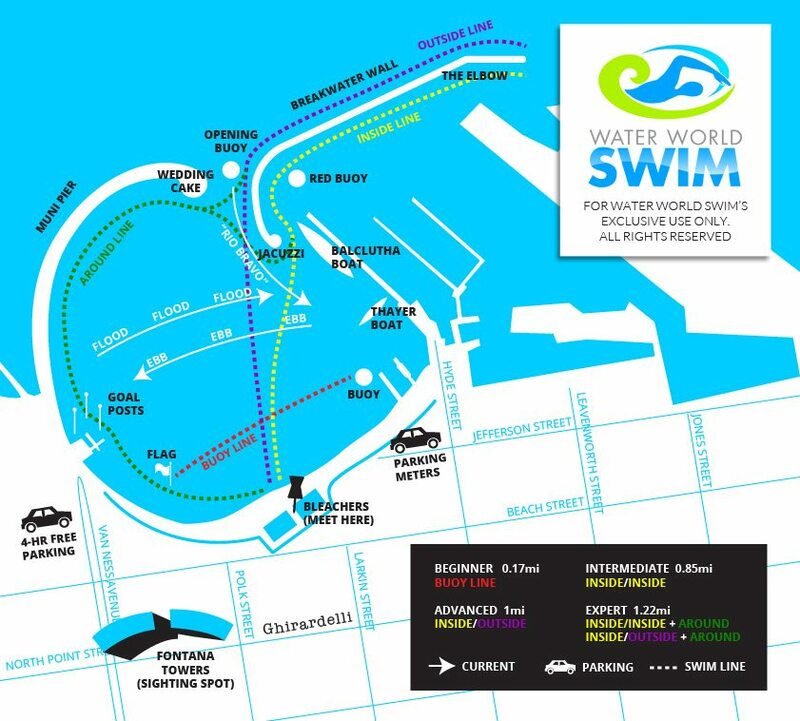 We have several routes that start within the cove for beginner swimmers. You'll have the opportunity to confer with coaches about your goals and ask for tips. Joining us for the first time? We'll start off by saying hi and introducing you to the group! We have first timers group together to swim the buoy line with guidance from an onshore coach. You'll have a more individualized introduction to the bay and your coach will help you consider your goals, speed, and comfort level so you can dive right into the right group for you at your next session. Fill out our swim waiver! It's required to join any clinic or Swim With Pedro with us. You only have to fill it once per year and you're set. If you do not fill one out online, you will be asked to do so on site, so save time by getting it done in advance. Head to our calendar to browse for the date that works for you. Click on it, and proceed to registration by adding it to your Event Cart. You can register for more than one session - just add the right dates to your cart before check out. Make a free account so you can save your registration details and not have to type them in each time. 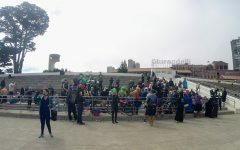 Non-members pay $18 online, or $20 onsite. Minors swim for $15 regardless. Members swim for free! CAN I JUST DROP IN INSTEAD OF REGISTERING ONLINE? No. You must register online! Registering online gives us an accurate headcount so we can be sure we have enough coaches and safety staff both on land in the water. Dropping in makes it very difficult to ensure our high safety standards, so please - always sign up online. Some participants preparing for events, but some not. All are invited! Experienced safety kayakers and coaches excited to help you get your swim on! From February to mid-December, we swim every Sunday at 10:00 am. From April through September, we also swim every Thursday at 6:00 pm. The warmest water temperatures are August-October, and sometimes November. 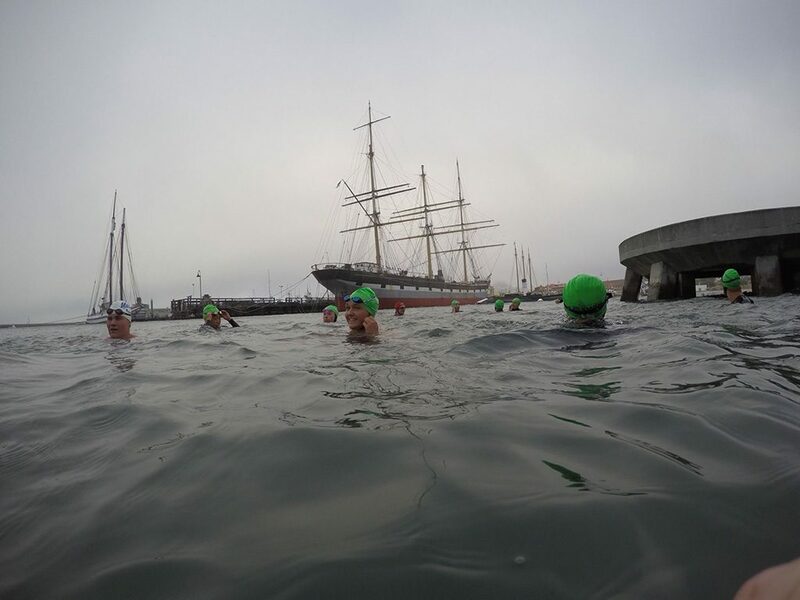 Most of our swims are at Aquatic Park, but the last Sunday of the month is at Crissy Field. 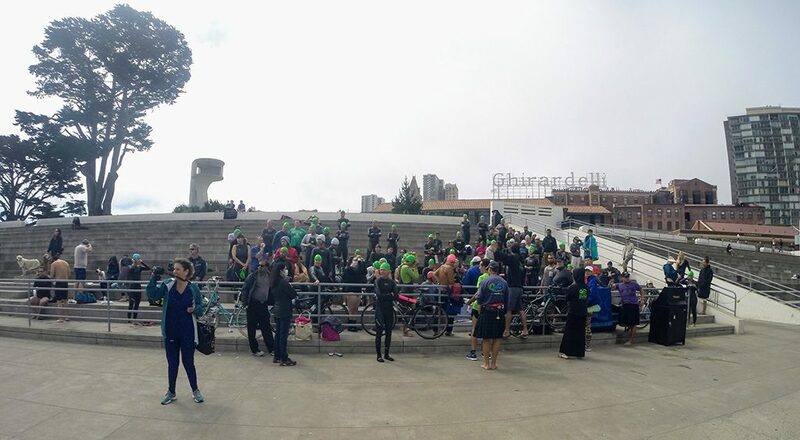 We are also there when there are event conflicts or construction at Aquatic Park. All levels of swimmers will learn and train equally comfortably in both - only the scenery and current patterns are different. Both locations have their advantages. 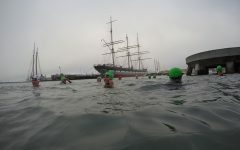 The swim at Aquatic Park is more protected from the outside conditions in the bay. 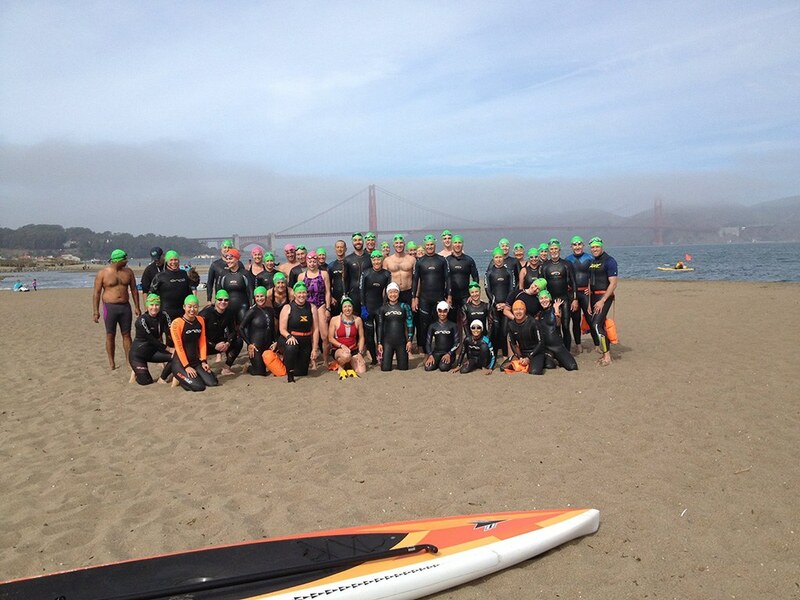 Crissy Field is great practice to swim along the beach and feel how the currents work. 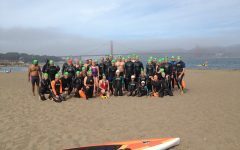 Beginner open water swimmers can stay closer to shore to practice technique, while those looking to practice the bay currents will be further out and can swim longer distances. Swim with us at either location, and we can assure you will have lots of fun and will learn valuable skills that will make your future swims easier! We swim rain or shine. That's right! Whether it's sunny or raining, we're going to be swimming. You just going to get wet anyway, and the moods of the bay are fun on all spectrums. If inclement weather, thunder/lighting, and/or excessive wind threatens our swimmers or our ability to look out for them, we cancel the swim and will let registered swimmers know by email and update the registration page. Cancellations are extremely rare - we often go years without any. OH NO! BUT IF IT'S CANCELLED, WHAT HAPPENS TO MY REGISTRATION FEE? Don't panic! Swim With Pedro sessions are our only events that are refundable or transferable for one session to another. So whether you cancel or in the rare case that we do, you can just scoot your registration to another session. Just contact us.